Hylas Yachts, which for 40 years has been known for building sailing yachts, has introduced its first powerboat: the Hylas M44. The Hylas M44 is from the drawing board of New Zealand designer Dean Salthouse. The Downeast-style yacht has twin 370-horsepower Yanmar diesels for what the builder says is a top speed approaching 30 knots. In the salon, opening windows add to the airflow, while guests can dine indoors or out. An aft galley is between those dining spaces, for serving access to each. Accommodations include master and guest staterooms, with extra space for kids or guests atop two convertible dining tables. 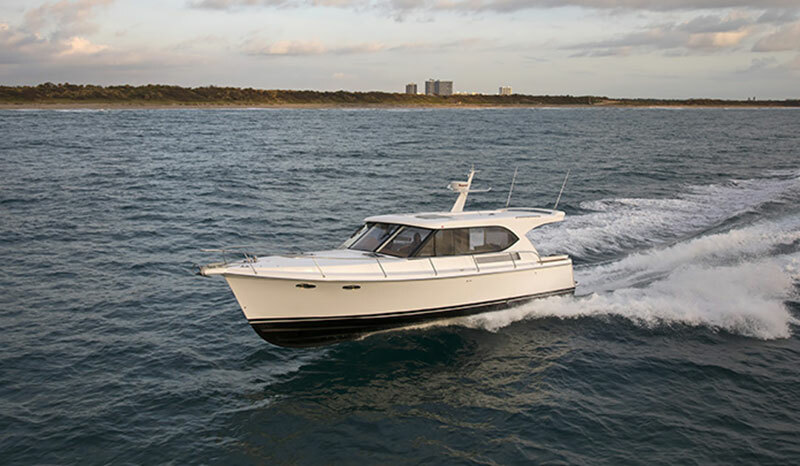 Standard features: They include a teak cockpit sole, Raymarine electronics and an underwater exhaust system, along with a bait well in the swim platform, tie-down loops for paddleboards, and anchor cameras.